A half-century ago, the Ford Mustang went to Europe and claimed its first ever motorsport victory, in the Tour de France. And the French have never really let it leave. 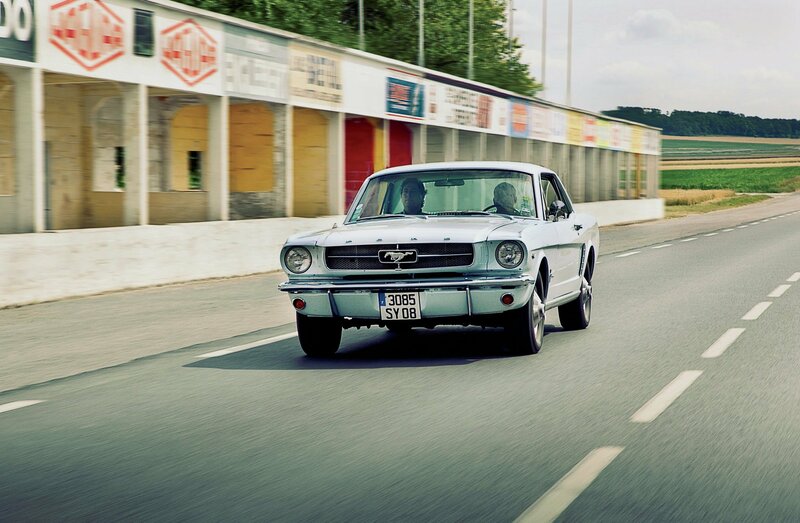 There wasn’t a soul on the public highway dividing the grandstands from the pits at the old Reims road circuit when I pulled our 1965 Ford Mustang to a stop along the pit-side shoulder. Before I’d even switched off the ignition, the first excited passers-by on that highway had already spotted the tidy blue notchback, swerved to an abrupt halt up ahead, and scurried back with their camera phones primed and ready. It was a routine that would rapidly become very familiar. 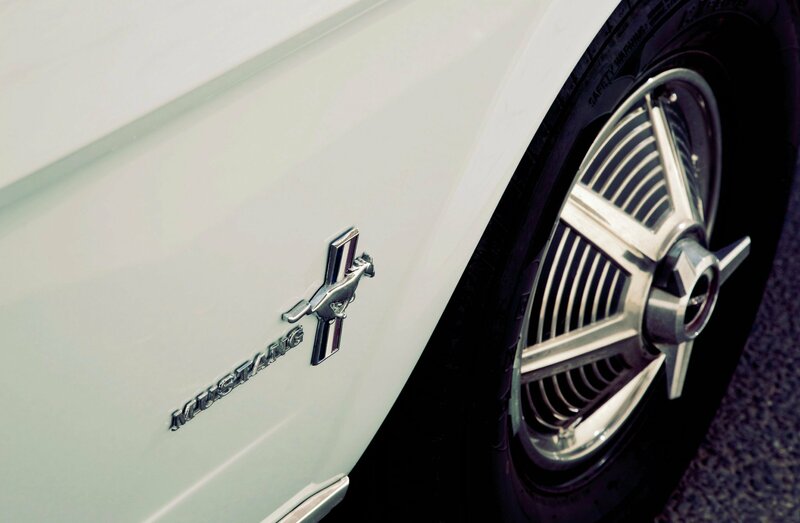 The simple fact is the French, and not just French car enthusiasts, absolutely love Ford Mustangs. Mustang lust strikes as many different kinds of people in France as it does back home in the States, and for as many different reasons. 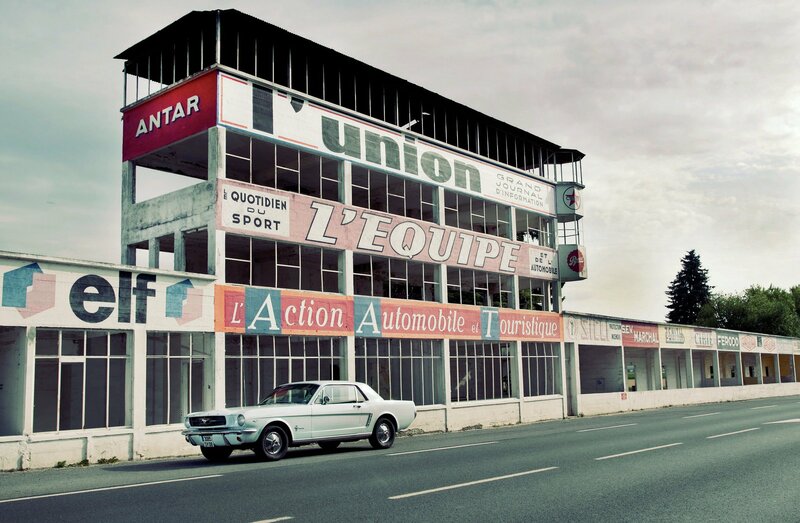 One episode in particular vaulted Ford’s groundbreaking ponycar into the complete, collective French consciousness, and it started here at Reims, in northern France, in September 1964, when the brand-new Mustang took on the country’s biggest motorsport event, the Tour de France Automobile. The TdF Automobile genuinely was big, in every respect. Founded in 1899, four years before the famous bicycle version, it covered more time and distance than the Mille Miglia, the 24 Hours of Le Mans, or the Rallye Monte Carlo, and had equal if not greater international status. As the name implies, the format involved a driving tour of France, in which competitors stopped to race at each of the major circuits, filling the miles between with kamikaze mountain climbs and forest road sprints. Precise timing was applied even to the transit runs linking the speed sections (which is probably why some accounts describe it solely as a rally). Overall event winners were decided on aggregate results—more than half the field typically didn’t finish. It was the Mustang’s first major-league racing victory, and it became a French PR gold mine for Ford. However, the Touring category, where everything that wasn’t a two-seater raced, looked to be a long shot. The dominant Jaguars had won five years in a row, and the same crew that had claimed the last four victories would drive the factory-backed lead car. Ford’s primary weapon against Jaguar was the Mustang, which had been introduced not quite five months before and with no racing credentials whatsoever. 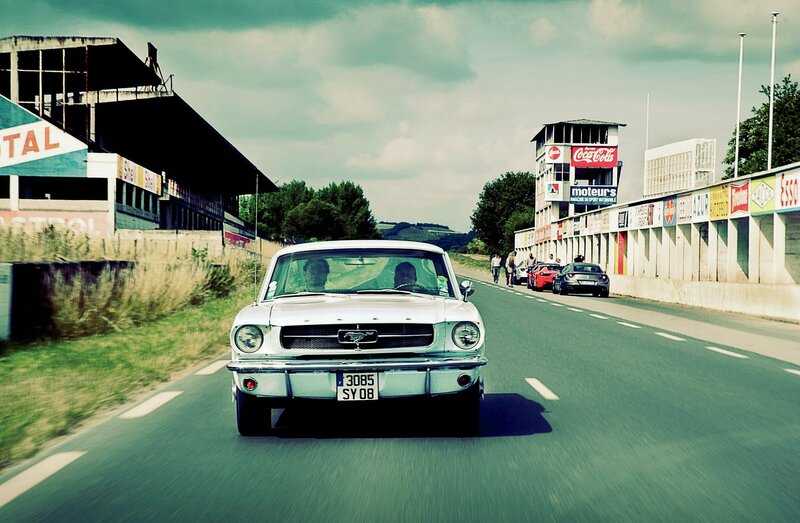 Above: Haute Wheels: In 2014, we cruise along the pit straight at the Reims circuit, scene of past Mustang glory, in a 1965 coupe owned by French Mustang fanatic Nicolas Blanche. Ford wasn’t completely clueless, though. The four red Mustang coupes shipped from Detroit for the event were prepped by Alan Mann Racing, a British firm that had become an official Ford factory team, with an emphasis on rallying the Falcon Sprint. The Sprint was already more or less a proto-Mustang, sharing the same platform. As with the Falcon, Mann beefed up the Mustangs’ running gear, brakes, and electrics and tossed the 260-cubic-inch V-8s in favor of race-ready 289 engines, reputedly worth 285 hp, purpose-built by Holman & Moody. Mann entered three of the Mustangs in the TdF, holding the fourth in reserve for parts. Kickoff that year was a one-hour blast on the Reims circuit, established in 1926 on public roads. 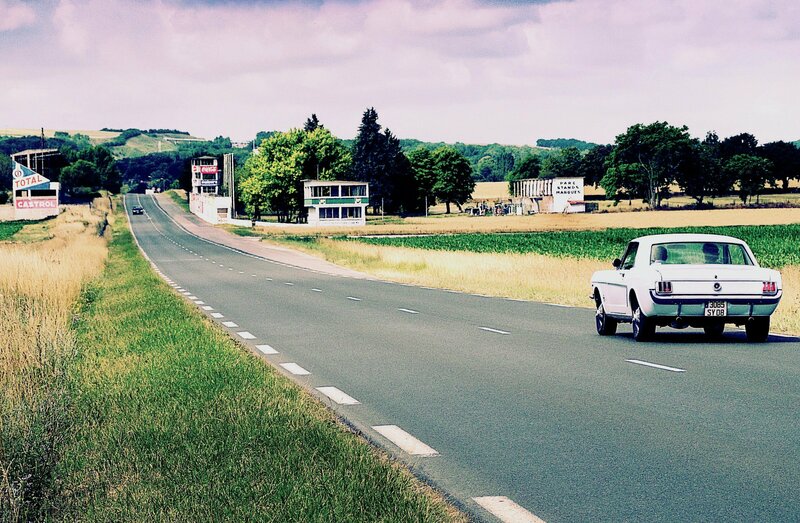 Also known as the Circuit de Reims-Gueux, because some earlier track configurations nipped into the village of Gueux, Reims by 1964 was pure car killer. The narrow, 5-mile track was basically triangular, composed of two endless, flat-out straightaways and one virtually flat-out stretch of sweepers, linked by three crawling-speed turns, with no barriers anywhere. Launching your virgin race car there was surely mechanical trial by fire. The Mustangs barely broke a sweat. They romped home 1-2-3, showing the Touring field nothing but tire smoke and taillights. Then, as if to prove it was more than a matter of brute American horsepower, they went to the fast, winding Rouen hill circuit and did the same. 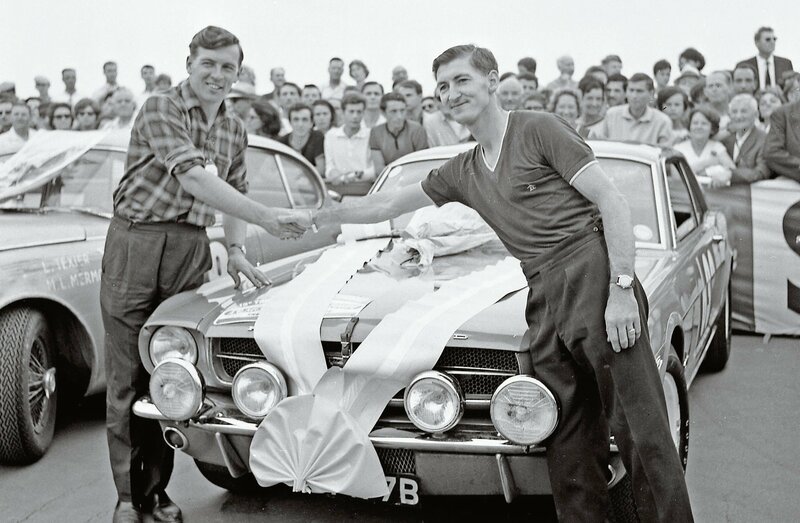 Above: Pony Pride: Brits Andrew Cowan (left) and Peter Procter with the winning car. All told, Mustangs won 13 of the 17 speed stages and took first and second in the TdF final Touring results, eighth and ninth overall, with Brits Peter Procter and Andrew Cowan co-driving the frontrunner. The third Mann car might have handed Ford a clean sweep, had it not been disqualified, allegedly for unauthorized help with a battery problem; instead, third place was Jaguar’s consolation prize. It was the Mustang’s first major-league racing victory, and it became a French PR gold mine for Ford. Mustangs were instantly cool, and in that circular logic of coolness reinforcing coolness, French pop culture fell for Mustangs because Mustangs were cool, and Mustangs were cool because French pop culture fell for them. Not that the French really needed a push; they were eminently ready to jump. Forget the xenophobic prattle we’ve all heard; most French people are actually quite enamored of things American—which likely has something to do with two centuries of shared national founding principles. French pop culture was already sweet on Mustangs before the ’64 TdF sealed the romance. 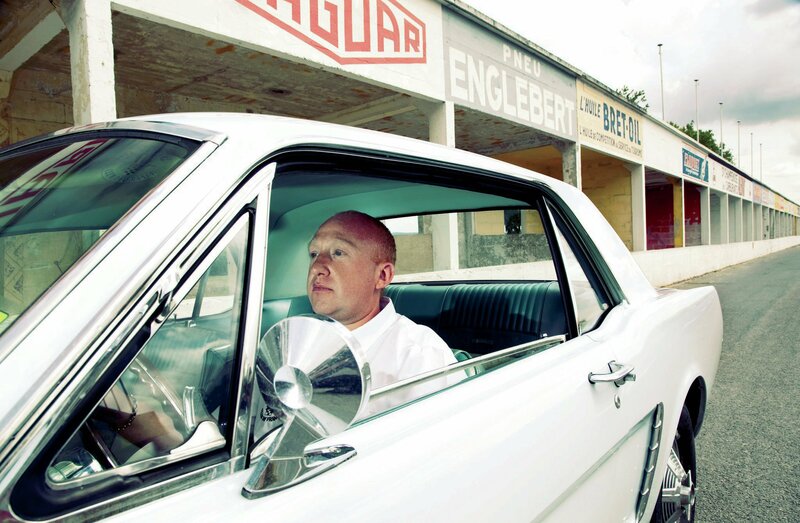 The car’s global cinematic debut was in the French comedy “Le Gendarme de Saint-Tropez,” three days before the Reims win, and a week in advance of a Mustang appearance in the possibly better-known “Goldfinger.” Far more influential, however, was the 1966 art-house classic, “Un Homme et Une Femme” (“A Man and a Woman”), which some call the greatest Mustang movie ever, starring not one, but three Mustangs, plus a GT40. Oh, and some French dude playing a racing driver. And a woman. 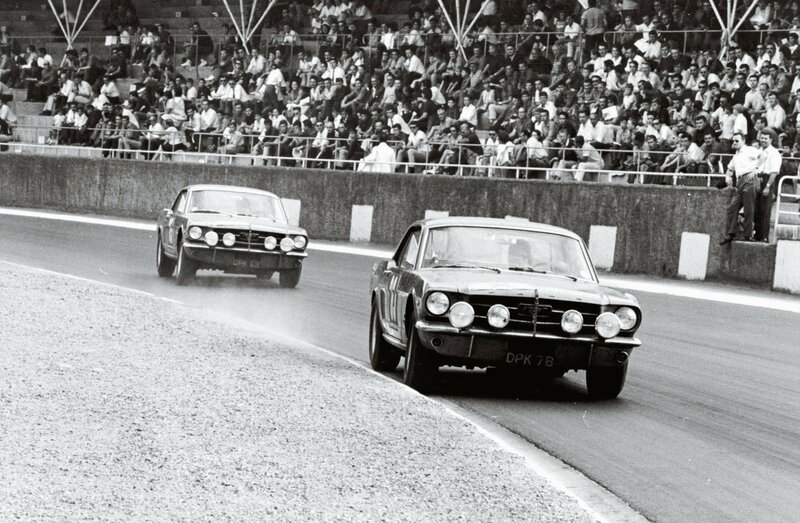 Above: Mustangs clip an apex at another 1964 Tour de France track. Music naturally contributed as well. Johnny Hallyday, in addition to being France’s favorite ’60s rock star and media idol, was also its favorite Mustang owner, and with a little encouragement from Ford France, rallied one on the Monte. That definitive dirty bad boy, Serge Gainsbourg, recorded “Ford Mustang,” either paying homage to American society or ripping it to shreds; with Serge, it was always hard to tell. Either way, the MOOSE-taahng, as the Francophone world delightfully knows it, rapidly came to mean something, and whatever that was, the French liked it, and wanted some. Unfortunately, French Mustang fans have had to largely rely on the gray market. The 2015 Ford Mustang, however, will be the first officially offered through European Ford dealers since 1979. Blanche uses the car a lot, driving it to Mustang Club of France gatherings all over the country. He picked a good example for the purpose. 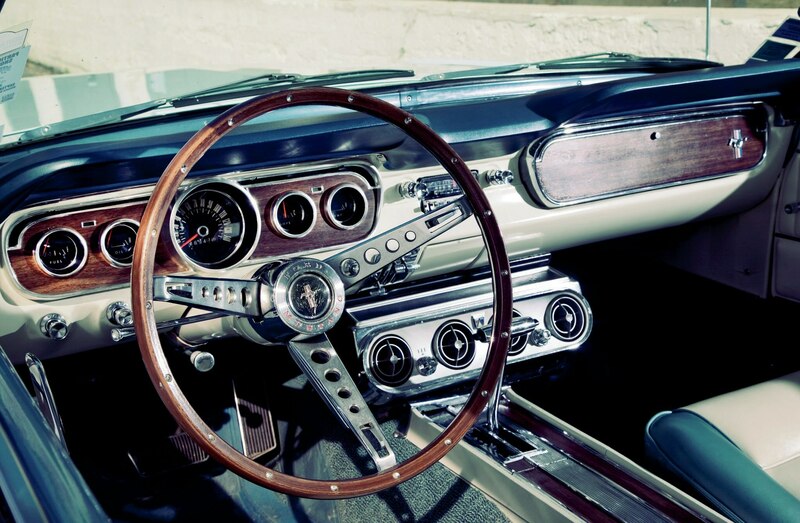 In my faraway youth it would have been considered the perfect daily driver: a 289 automatic, with the deluxe Pony Interior, power steering, and air conditioning. It’s box-standard, retaining the non-assisted drum brakes. After coming over from America, it had a thorough going-through by Fred Mustang Garage near Reims, and it’s never let him down. Blanche says he cruises easily on the French autoroute (speed limit: 81), and he’s won club show trophies, too. Driving it on the remnants of the old track is a stark reminder of how much the whole world has changed since 1964. Technically, none of the original circuit remains except the main-straight grandstand, the pits opposite, and some associated structures, now under restoration by local volunteers (see below). The racing surface, as a public thoroughfare, has obviously been re-laid and widened many times, the corners have been re-contoured, and the longest straightaway is now four lanes. If the details of the track have changed, its character hasn’t, and all you need to grasp the concept of insanely fast, headlong charges into gut-busting right-handers is one strong launch from the head of the grandstand stretch. The hairpin there is gone, but the café where diners once watched the racing over lunch still remains, and so does the gentle slope running down to the stands. A powerful car will be truly screaming along before the first seats; the Mann Mustangs could nudge 150 mph, and on the downhill toward the start-finish line, probably bettered it, with nothing but luck separating them from the busy pit lane. Hold on tight after that, because even fast road cars get light over the following brow, and then you hope the brakes can scrub enough speed for yet another hairpin. The Mustangs’ disc brake conversions probably didn’t stop a whole lot better than drums and took just as much grunt to do it—they simply lasted awhile longer. Kick it through the corner, and start rushing toward 150 mph again, praying now that if you go off in these high-speed sweepers, you won’t collect one of the concrete flag stations or route markers you can still see in the weeds beside the ditches lining the road. I backed off about 200 yards after the café, put my elbow up on the door, and just listened to the lovely V-8 rumble. If I’d been here in 1964, I think I’d have been watching the action over a nice, long lunch in that café. For 10 years, a group of French enthusiasts have fought the good fight, to save a piece of motor racing history for us all. Grand Prix drivers of the pre-sponsorship era loved Reims-Gueux. It was fast and deadly, but the nearby city of Reims is the capital of the rich Champagne industry, and oceans of the stuff, and ample cash to match, were awarded for lap records, poles, and the like. For nearly half of the 20th century, it saw some of the finest pilots and the finest races, in not only GP, but sports cars and bikes as well. In 1972, however, the lights went out forever, and slowly the place began returning to the dust. By 2004, only the pit straightaway building complex was left, and that was crumbling fast. That’s when the all-volunteer, self-funding Friends of the Circuit Gueux was formed, and today the complex is a protected heritage site, safe from predation, preservation is in progress, and non-speed events are held on the site. Special thanks to Mustang fan and French translator Fabien Daniel; the Mustang Club of France; and Fred Mustang Garage. In which our design editor built a shooting brake. Ford’s success spurred the creation of both the Camaro and Celica.